This week in co-op, I spent some quality time with bapenguin in Mercenaries 2 doing just that. Messing around. While playing Mercenaries 2, a number of amazing things happened in just a few hours of play. Right off the bat, while driving large vehicles, we discovered that all of the pedestrians in Venezuela are suicidal. Pedestrians would virtually line up to be smooshed by your tank, truck, or stolen car. Many would dive directly into traffic when the maniac (one of us) would be driving in the streets! What was this about throwing a truck at someone? In a literal sense, that did happen. I threw a tank at a helicopter using a ramp, tape, and bubble gum (no bubble gum or tape required). While working on a mission to set beacons on rooftops and junk yards, I hijacked an enemy vehicle while bapenguin took care of a helicopter. Evil Knievel was mentioned, and we wanted to see if you could jump a helicopter with said truck from the roof of a building. Needless to say, it didn't quite work. I hit the front of the helicopter like a brick wall, and plummeted to the ground in a blaze of hysterical glory. As a mercenary, things tend to explode around you. A lot. Sometimes you're hit with a rocket that launches you several blocks away, where you land on a rooftop. Sometimes your vehicles explode with you inside them. While in a burning vehicle, it is recommended that you stop, drop, and roll as far away as possible before that vehicle explodes. While in such a scenario, bapenguin and I rolled for our lives, and a passing vehicle decided to give our burning truck a nudge with his bumper. Both the truck and car exploded, sending doors and wheels flying every which way. Meanwhile, the silly driver kept trying to drive forward as though the doors hadn't just been blown off his vehicle! Soon afterward his vehicle went kaboom, and he flew out the (doorless) side faster than an anorexic too short to ride a roller coaster. 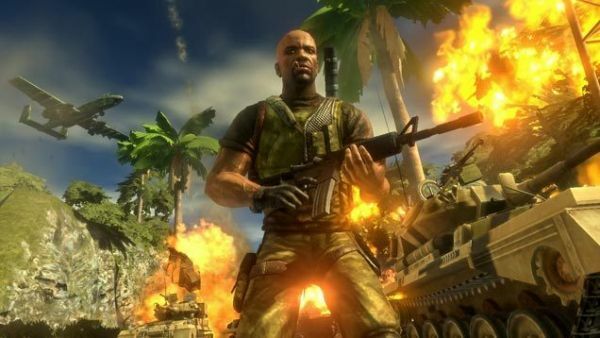 A few glitches, some massive explosions, and co-op is all you need to have a blast in Mercenaries 2. Just a helpful hint, several (not all) Best Buy locations have a 15% discount on the $19.99 title in store! What're you waiting for? Hit me with your best truck.